One of the county's greatest assets is its seemingly infinite stretch of riverfront land, cultural events and outdoor beauty, but to draw people to it, transportation options will need to be improved first. That was a consensus of more than a dozen members of a new Columbia County Tourism Committee who met Tuesday to dial in on the county's strengths and opportunities for improvement. The exercise was part of early planning stages of developing a Regional Cooperative Tourism Plan under the direction of Travel Oregon, which directed funds to the Columbia County Economic Team to initiate the process. The plan will identify the best use of state hotel tax dollars for marketing tourist activities and destinations in Columbia County. The committee and planning efforts are being led by Alison Hart, of Portland-based A. Hart Associates. Committee members noted scenic trails, bikeways, parks and fishing opportunities, but as they soon found out, tourists from outside the county who aren't traveling in their own car, will likely have a hard time accessing them. "There aren't any rental car agencies and you can't really get a taxi out here," Hart noted, summarizing feedback. One member said guests who fly into Portland and want to visit St. Helens will often end up paying close to $180 round trip using a ride service like Uber or Lyft. A lack of hotel lodging and lack of easy transit access were highlights of the conversation. 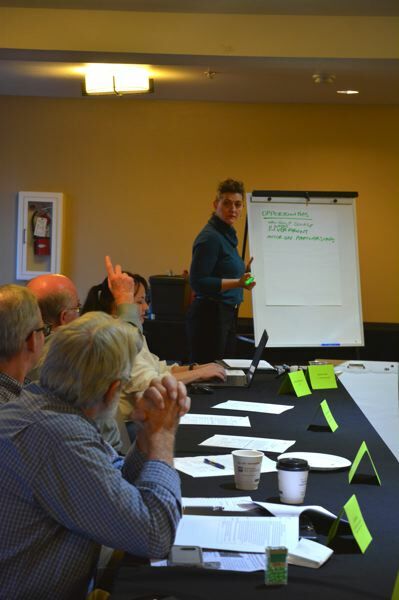 Tuesday's meeting was the second time the recently assembled steering committee- made up of business owners, a county commissioner, nonprofit managers and officials from Scappoose, Columbia City and St. Helens met to chip away at creating the plan. Before identifying what draws people to the county from outside the area, the group will first establish a leadership structure, roles, and a charter, setting guidelines for how meetings and the planning process will be run. "It's going to be the foundation of how we create our priorities, in the big picture of destination planning," Hart told the committee Tuesday. "We need to have a strategy before we can get into the tactical and operational." Shortly into the process, members began spit-balling suggestions and observations about what defines the county's strengths and weaknesses. Christine Dahlgren of Clatskanie said, as a hotel owner, she's noticed a lack of guide materials or comprehensive lists for tourists. "We see so many people that come through and ask questions, 'What's there to do? Where's there to go?' and we have nothing to give them," Dahlgren said after Tuesday's session. "Trying to create that as a sole entity is difficult." The tourism committee will meet monthly at different locations. While the public is not prohibited from attending meetings, input from non-committee members is not allowed yet. Hart said that community input will be gathered at a future date.